As cancer patients know all too well, many highly effective anti-cancer drugs don't stay effective long. Most tumors will become drug resistant over time as their cells rapidly mutate. Chemists from The University of Texas at Austin and Korea University have demonstrated a new approach to blocking cancer-drug resistance that they believe could be applied to any type of cancer. In a dramatic result, the approach — which involves chemically combining two existing drugs in a new way — produced 50 percent smaller tumors in mice compared with a traditional treatment with the same drugs given separately. "The best part is that our combined drug candidate was so much more effective than one of the most powerful cancer drugs on the market," said Jonathan Sessler, a professor at UT Austin and co-lead author of a study published today in the journal Chem. "The difference is mind blowing." A team led by Sessler and Jong Seung Kim at Korea University has developed a drug lead, provisionally called C1, that simultaneously keeps cancer tumors in a vulnerable state and delivers a potent toxin. Tumor-bearing mice that were given their drug had about 75 percent smaller tumors after two months than mice that were not treated and tumors half the size of the ones found in mice receiving the same drugs separately. 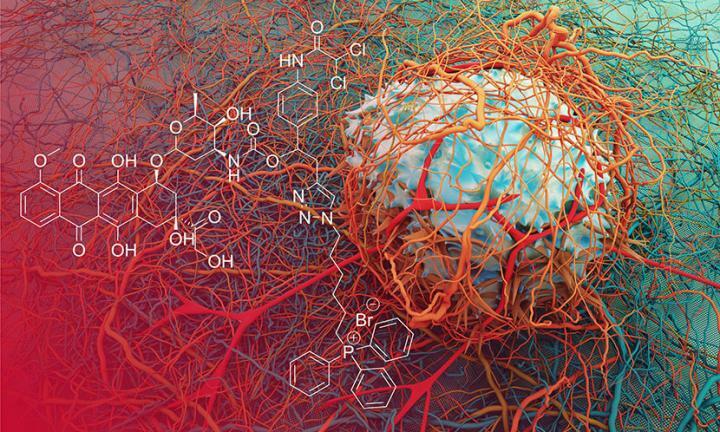 The drug works in part by targeting a tumor's metabolism. When it's just starting, a cancerous tumor is like an out-of-shape runner: It has a hard time catching its breath. It's growing so fast and burning so much energy that it can't get enough oxygen. Normally, cells in the body use aerobic (oxygen-requiring) metabolism, but early-stage tumors shift to anaerobic metabolism, which is less efficient. Just like the out-of-shape runner, gasping for air and experiencing cramps, in this early stage, a tumor's metabolism is abnormal and it's vulnerable, so this is also when many cancer drugs work their best. But as tumors mature and shift their metabolism, like the runner getting into better shape, they often become drug resistant, a life-threatening twist for patients. The chemists' innovation was in physically linking an anti-cancer toxin to a molecule that can keep tumors from breathing normally. "When it switches to a more normal metabolism, it develops resistance," said Sessler. "But if we stop it from switching, we can keep exploiting that vulnerability." Two of the active elements in C1 are Doxorubicin (Dox), a powerful cancer chemotherapy agent that's been used for decades; and a dichloroacetic acid (DCA) subunit, which reverses a cell's metabolism to anaerobic. The researchers didn't invent these two elements, but they are the first to combine them into a single molecule and test them on tumor-bearing mice. Sessler says the key to C1's effectiveness is that the two active elements are combined in a single molecule so that when they reach cancer cells, they are in the same place at the same time. A third element targets a part of cancer cells called the mitochondria and then allows the release of Dox and DCA from there. This latter design element ensures that the two active drug elements get delivered where they will be most effective. "Right now, a cancer diagnosis is often a death sentence," Sessler said. "We'd like to see cancer become a chronic disease in our lifetime." The study's other UT Austin co-author is research scientist Jonathan Arambula.